Memory implies truth, but it does not imply that the memory content is an exact duplicate of the past thought content. Sometimes memory allows for moderate transformations of the informational content. 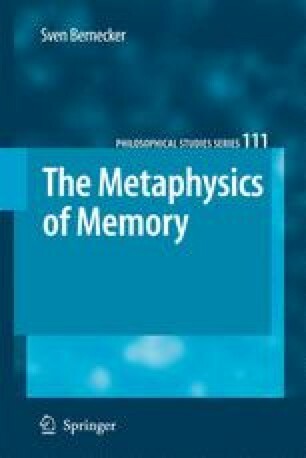 In the previous chapter it was shown that it depends on the context whether memory requires literal reproduction of contents or whether there is room for minor variations of the previously learned information. Sometimes the content (or the that-clause embedded in the content) of a memory state has to be type-identical with the thought content it causally derives from, sometimes it suffices if the two content-tokens are of similar types. The aim of this chapter is to investigate the extent to which two content tokens may differ from one another and one of them still count as a memory of the other. Given that the context is such that remembering does not require the regurgitation of contents, what is the permissible range of aberration between the original content and the memory content? When are two diachronic content-tokens sufficiently similar for the later to qualify as a memory of the earlier? What is the semantic tolerance of remembering? What is the margin of error of the content-identification of propositional remembering? I will set forth principles which specify the degree to which two thought-content-tokens may differ from one another and the later one still be able to be classified as a memory of the earlier one.